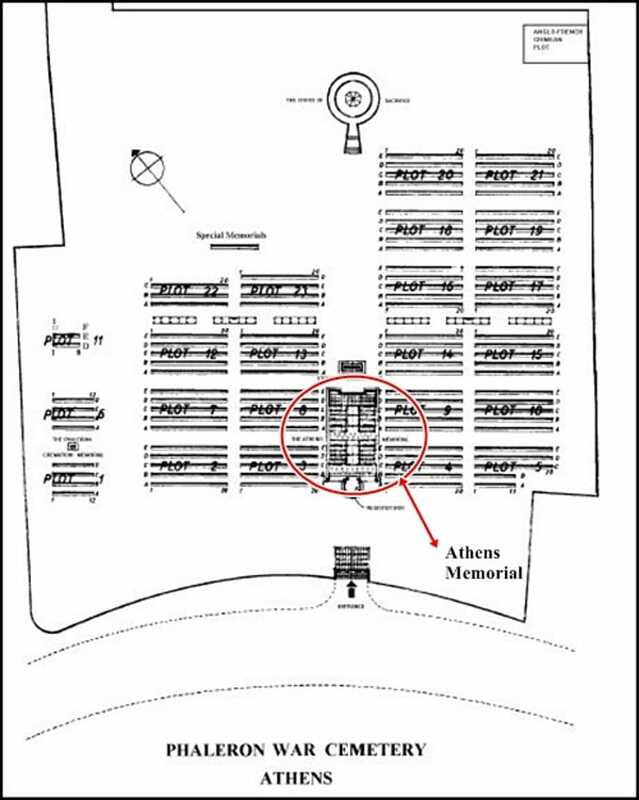 Access to the Athens Memorial is through Phaleron War Cemetery. 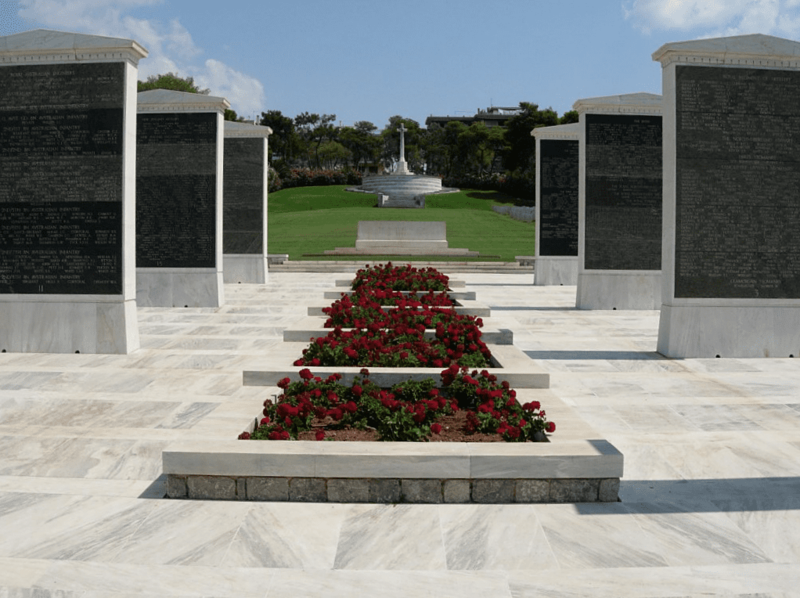 Phaleron War Cemetery lies a few kilometres to the south-east of Athens, at the boundary between old Phaleron district and Alimos-Kalamaki district, on the coast road from Athens to Vouliagmeni. The easiest means of reaching the cemetery is by the coastal tram, which takes about 35 minutes from the terminus at Syntagma Square on route 5 (Platon) towards Voula. Alight at Pikrodafni, a stop about 100 metres after the cemetery, from where it can be easily seen. The Athens Memorial stands in the cemetery. Access to the Athens Memorial is through Phaleron War Cemetery. Phaleron War Cemetery is permanently open and may be visited at any time, including weekends and public holidays. 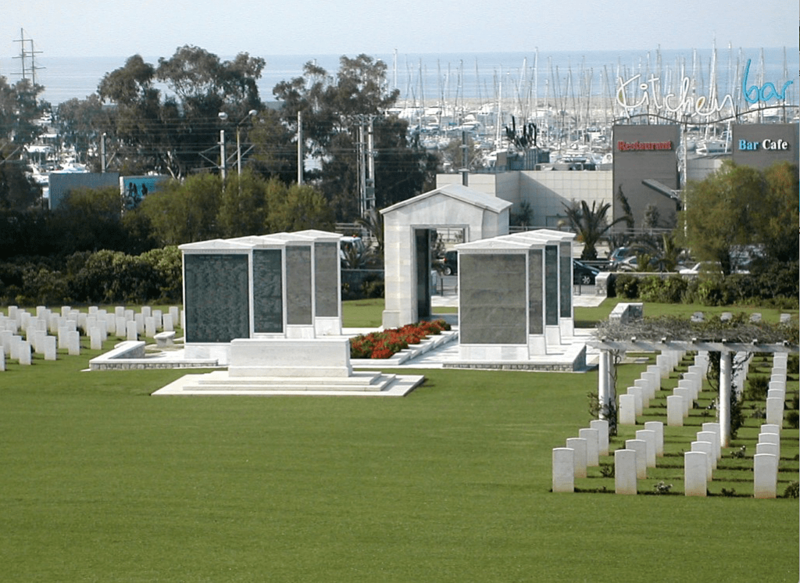 The site of what is now PHALERON WAR CEMETERY was chosen originally by the 4th Division as a burial ground for Commonwealth casualties of the Greek Civil War (December 1944-February 1945). Subsequently, the military authorities, in conjunction with the Greek Government and the Army Graves Service, decided that it would be the most suitable site for a Second World War cemetery for the whole mainland of Greece. The 23rd and 24th Graves Registration Units and the 21st and 22nd Australian War Graves Units worked together to bring in graves of the 1941 campaign from the battlefields, temporary military cemeteries and from various civil cemeteries. There are now 2,028 Commonwealth servicemen of the Second World War buried or commemorated in this cemetery. 596 of the burials are unidentified. Special memorials commemorate casualties known to have been interred in certain groups of graves in the cemetery, but whose individual graves cannot be precisely located within these groups. Other special memorials commemorate casualties re-buried in the cemetery from original graves which, owing to the destruction of local records, could not be identified. 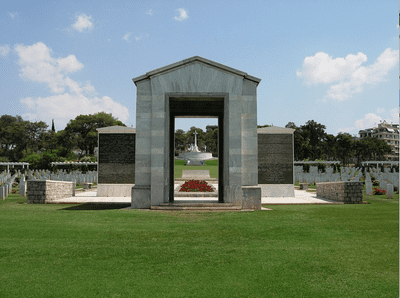 Also within the cemetery is the PHALERON CREMATION MEMORIAL, commemorating 74 men of the army of undivided India who died during the campaigns in Greece and Crete during the Second World War and who were accorded the last rite required by their religion - committal to fire. In the north-east corner of the cemetery, a plot contains the graves of servicemen and civilians who after serving in the Crimean War, died in Greece, and were buried in the Anglo-French Crimean Cemetery, New Phaleron. The graves were moved in 1966 when that cemetery could no longer be maintained. 1st December 1944, aged 37. Son of John and Eliza Blampey; husband of Doris Hildreth Blampey, of Bilton Grange, Hull. 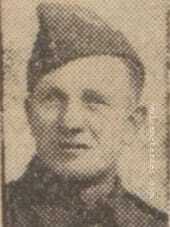 Augustus George Evans, M. M.
Sherwood Foresters (Notts and Derby Regiment) and Special Boat Service, S.A.S. Regiment, A.A.C. 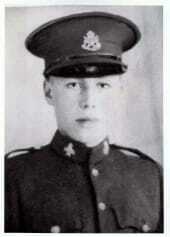 7th April 1944, aged 23. Son of Augustus and Ada Evans, of Chaddesden, Derby. 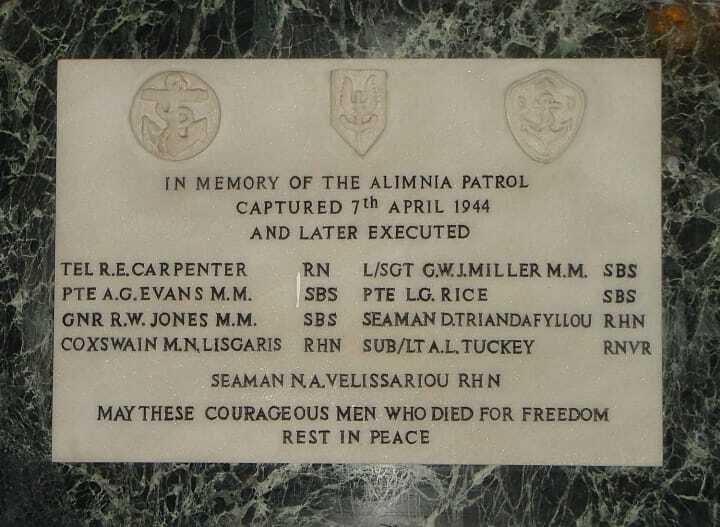 (Augustus was captured near the Isle of Rhodes on 7thApril 1944 with six members of the Alimnia Patrol, Special Boat Service and three sailors of the Royal Hellenic Navy, all later executed by their German captors close to Thessaloniki). A Memorial service was held on 22nd May 1992 at St Paul's Anglican Church in central Athens for the Alimnia Patrol, who were captured on 7th April 1944 and later executed, after prolonged torture, by their German captors. The congregation consisted of British and Greek Special Services personnel, united by their collective experiences of the WW2 conflict, and also senior officers representing the Greek armed forces. The event was organised by the British embassy in association with Lord Jellicoe in the UK and Jason Mavrikis, Special Air Service Regimental Association representative in Greece. Those attending from the embassy included British Ambassador David Madden and his wife as well as the defence, naval and military attaches. Above is a photo of the plaque which was erected in St Paul's church Athens at a memorial service on May 22nd 1992. This was following an enquiry by Margaret Thatcher which revealed the story of the Alimnia patrol for the first time to the families who had not known what had happened to their sons, brothers and husbands for more than 40 years. This knowledge came too late for my grandparents. There is a chapter dedicated to the Alimnia Patrol in the book The SBS in World War II by Gavin Mortimer.